For those striving for the ultimate in Mission, Bungalow or early 1900�s styling, this Craftsman Lace pattern is an authentic reproduction. 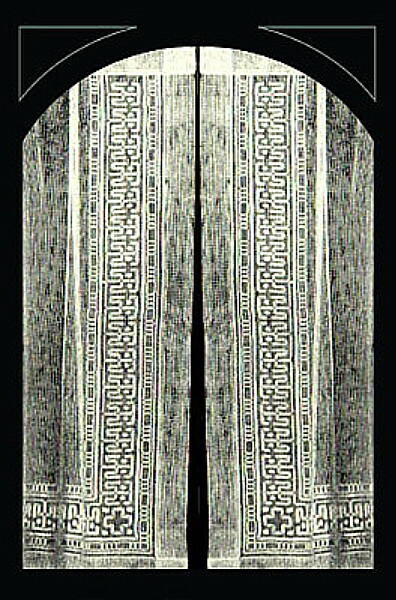 Sold only in pairs, there is a left and right mirror-image panel that features an intricate Arts & Crafts border as shown above. Since the center of the panels are a plain lace field, these curtains are best gathered to create privacy. Woven of 100% Scottish Cotton finished ivory, there is a rod pocket and header at the top of each panel. There is no exact formula for determining which is the correct measurement of length and width when buying lace curtains. Usually, the decision is based on one of two eras of decor: 19th or 20th century. In the 19th century, Federal, Greek Revival, Early and mid Victorian and some Colonial Revival, window treatments were �fuller� with more gathering using a ratio of 1� to 2 times the window width as the curtain panel width. Our Bellflower, Brownstone, Cherwell, Grecian, Eastlake, Oak & Acorn, Old Colony and Regency panels work best in these instances. Also, it was custom to have the lace panels hang below the window sill, sometimes even pooling onto the floor although baseboard height was most common. 20th century Arts & Crafts, Art Deco, Bungalow, Craftsman, mid-Century Modern and Mission window treatments were much �flatter� with much less gathering using a ratio of 1 to no more than 1 to 1� times the window width as the curtain panel width. Our Art Deco, Craftsman, Dedham, Galaxy, Ginkgo Leaf, Glen�s Edge, Hunter Rose, Pine Cone and Prairie Sumac panels work best in these instances. The preferred length for this era is just touching the window sill. As a rule, American home windows are between 25� and 30� across. Our 47� panels work fine for the fuller gathered look; our 33� panels are best for the flatter less gathered look.We also offer panel shortening for the length you desire @ $10/panel; please specify in the Order Comments of Checkout Step #5. Click underlined product names to view a picture of the item.